Located in Sukawati Village, Mandala Village offers a tranquil retreat with calming views of the rice fields. It features an outdoor pool and an organic restaurant on site. Free Wi-Fi is accessible in all areas. 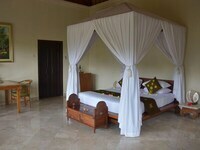 With a stay at Mandala Desa Boutique Resort in Sukawati (Batuan), you'll be convenient to Bali Zoo and Sukawati Market. 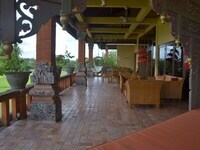 This hotel is within close proximity of Bali Bird Park and Tegenungan Waterfall. Make yourself at home in one of the 5 air-conditioned rooms featuring minibars and DVD players. Complimentary wireless Internet access is available to keep you connected. Bathrooms have complimentary toiletries and hair dryers. Conveniences include safes and desks, and housekeeping is provided daily. Relax and unwind with massages, body treatments, and facials. This hotel also features complimentary wireless Internet access, babysitting/childcare (surcharge), and tour/ticket assistance. Guests can catch a ride on the complimentary shuttle, which operates within 9 km. Grab a bite to eat at the hotel's restaurant, where you can take in a pool view, or stay in and take advantage of room service (during limited hours). Full breakfasts are available daily for a fee. Featured amenities include multilingual staff, luggage storage, and laundry facilities. A roundtrip airport shuttle is provided for a surcharge (available 24 hours), and free self parking is available onsite. Best place! We travelled all over Bali. Here we found peace, tranquillity, great food and very friendly staff. Our villa was very spacious and beautifully decorated. A hidden place, wehre you still experience some off the old magic of Balinesculture. great hotel for who to enjoy bali in diferent way. excelent hospitality, nice room, very good view. Alam Puri Art Museum Resort & Spa features luxurious accommodation with four-poster beds and Balinese décor. The resort houses an art gallery and offers a pool with swim-up bar. From IDR 638.400 (48 USD) per night. Bumi Linggah the Pratama Villas is located in Sukawati District’s Batubulan Village. It offers a restaurant and villas with a private swimming pool. Free Wi-Fi and parking are provided. Surrounded by rice fields, Villa Kayu Lama offers a peaceful retreat in Ubud. Guests can take a leisurely swim in the private pools or enjoy relaxing in-villa massages. Free shuttles to Ubud centre is available thrice a day based on schedule. Overlooking the rice fields in Ubud, Anulekha Resort & Villa offers an outdoor swimming pool and a spa centre. Free Wi-Fi access is available in this resort. Boasting a private outdoor pool, Munari Villa and Spa Batubulan is located 5 minutes’ drive from Bali Zoo and has free Wi-Fi access throughout the villa. Featuring an outdoor swimming pool and a garden, The Garga Beach Villas offers a self-catering villa in Ketewel, a 7-minute walk from the beachfront and a short walk from Hardy's Supermarket. The property has free WiFi access throughout. Located in Ketewel, 15 km from Kuta, Sri Abi Ratu Villa features an outdoor pool and views of the pool. Ubud is 12 km from the property. Free private parking is available on site. Featuring an outdoor pool, Umah De Ubud is a 10-minute drive from Monkey Forest. It offers a tranquil retreat amidst lush tropical greenery. Free Wi-Fi is accessible in all areas. Offering a garden and outdoor pool, Wana Ukir Ubud is set in Ubud. Elephant Cave is 3.9 km from the property. Free WiFi is offered . The accommodation is air conditioned and features a seating area. A minibar and kettle are also featured. Located in Ubud in the Bali Region, this detached villa is 5 km from Ubud Monkey Forest. The air-conditioned unit is 5 km from Elephant Cave. Free WiFi is provided throughout the property. Offering an outdoor pool with sun terrace, The Alena Resort is located in Ubud, a 15-minute drive from Ubud Palace and Ubud Market. Built around landscaped gardens, Chez Ida is a 10-minute walk from Tegenungan Waterfall. Its rooms are all fitted with a private terrace. Free Wi-Fi is accessible in all areas. Each private bathroom includes shower facilities and toiletries. Situated 10 minutes’ drive from central Ubud, Batuan Villa features an shared swimming pool accompanied by a gazebo in the gardens. Free Wi-Fi is provided throughout the villas.